How can you find a good property mentor who will help you achieve your financial goals? The best golfers have coaches. And some of the best property investors also have mentors to help them along the way. 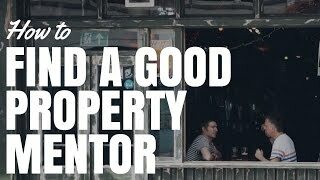 I recently got an email from an On Property listener asking them about what’s the best way to find a good mentor? And so, I thought I’d create this quick video to help you find a good mentor if that’s something that you’re interested in. Hey, I’m Ryan from onproperty.com.au, helping you find positive cash flow property. Finding a good mentor out of all of the different candidates out there can be a really challenging task. First, you have to find someone actually willing to take the time out to give you advise. Is it better to pay someone or is better to find someone for free? And also, you don’t want to get caught by a property spruiker and you don’t want to get a mentor who’s actually going to leave you in the direction that they want their life to go, rather than maybe the direction you want your life to go. First, we’ll talk about some tips before you start searching for your mentor and then we’ll talk specifically about how to find your mentor. First, let’s talk about what can you do before actually going out to look for a mentor. Let me tell you, there are so many different ways to make money in property. There’s so many different strategies out there that different people will have achieved different things. And most of the time, when someone is a paid property educator or a property mentor or whatever it may be, even if they’re just invested in property themselves and had some success, they’re likely going to say or have the idea that, “This is the best way to invest in property.” And that’s not always the case. Look, there’s so many different ways to do it. And depending in your goals and who you are, one way may be better than another. So you really need to understand, before you start looking for a mentor; what is it exactly that you want to achieve through investing in property? So, this takes 2 forms. First, it’s those goals of financial freedom or whatever your financial goals are mixed with the lifestyle that comes with that. So that’s one goal, that’s kind of the end goal that you want to achieve. But the other facet of that, the aspect that people don’t usually think about is how much work and how much sacrifice are you willing to do to get there? One thing for me, in order to achieve my goals, I don’t have huge goals of multi-billion dollars or anything like that. But, there’s only certain sacrifices I’m willing to make. I’m not willing to work 20-hour days every single day and not spend time with my kids as they’re growing up. For an example, let’s say developing can be a great way to make money through property. But often, it takes a lot of work. Creating the plans, being onsite everyday, dealing with council issues, all of that sort of stuff. You’re very active in the investment when you’re developing something. Whereas, if you just buy and hold a property and rent it out, then you’re not doing much for that property. So it’s very sort of passive investment. So, one investment might make you more money, but it also requires more time of you. And if you’re someone who doesn’t actually want to invest that time, even though development can be a great way to make money, it might not be suited to you because of the heavy time investment. So, it’s just these things that you think about before you go out and search for a mentor. Once you’ve kind of decided what you want to achieve, you want to look for a mentor who is on their way to achieving that or who has potentially achieved it themselves. Now, you don’t always have to have a mentor who’s achieved it themselves, but that just helps you along because they’ve already gone through the trials and the difficulties and things that you’re likely going to go through and it’s much easier for them to guide you through that. However, they don’t need to be exactly where you want to be. You know, they could just be a really great property investor and if they can understand your goals and work through that with you, then that’s going to be great. But, the problem that I find is when someone has achieved investment goals using a completely different strategy to what you want to use, they’re going to be wired and they’re going to have success behind them that says, “This is the best way to invest.” But you want to do it another way and they’re going to try and pull you into their line of thinking. So, just be aware of that. It’s just a natural things that happens with people when they’ve achieved success. They think that’s the best way to do it and they want to try and teach everyone else to do it as well. We’re all subject to it in our lives. That’s why when you have kids, your parents are telling you this is the best way to do something even though you may do it different and it’s fine. They did it that way and so, therefore, they think it’s the best way to do it. It’s just part of life, but something to think about when looking for a mentor. Now, really specifically, where should you look for a mentor? I definitely think there’s a few places you shouldn’t look. Let’s talk about those first. The first are property advisors or property mentors who are going to help do everything for you, but their service is completely free. So they’re going to find you a great property. They’re going to help you get a loan for that property. They’re going to help you with the solicitors and organising that. They’re going to organise the builder for you as well. And, they’re going to do it just out of the goodness of their heart because they’re just such great people and they care about you so much. No, no, no. These people are generally property marketers. They’re selling you a development. They’re selling you a new build property and they’re making a commission generally from multiple sources on the backend of that. So in terms of where their best interest lie, they need to sell a development in order to make money and you’re just some schmuck who’s come in that they need to sell a property to. So when it comes to mentors, avoid those people, avoid those companies that offer house and land packages with positive cash flow and guaranteed rent. They’re not going to be the mentors that you want because they have an ulterior interest. You know, they’re getting paid to sell a product and you’re the person buying that product. I really don’t trust those people, so I would definitely avoid those. I’d also be careful of trying find a mentor at free seminars. Free seminars are usually given out as a marketing strategy to get you to buy other stuff – to buy courses or training or properties. So if you go to a free seminar, probably not the best place to find a mentor. So that kind of leaves us with a couple of options. One of the first options, which anyone can do is to go on something like meetup.com and to look for local property groups in your area. So, look for people who meet on a regular basis – it might be once a month or something like that. And these are property investors who are just meeting up to talk about property. They’ve all got an interest in investing in property and so they meet together. Sometimes they have a speaker, sometimes they don’t. But, go to these events, talk to people. Don’t to there and just walk up to the first person you meet and say, “Will you be my mentor?” But, go there, get to know people, get to know their stories. I believe it’s a really big deal if you’re asking for advise from someone, you’re going out for coffee, shout them the coffee. If you go on out for lunch, shout them the lunch. You know, they’re giving you invaluable advise and so, I just think that’s common courtesy. Once I had someone and they ask to go out for lunch. So we went out for lunch. I ordered, they didn’t order anything. It was an awkward situation where I was eating food and they weren’t. No offer to pay for anything, not even a coffee or a drink or something like that. You know, it’s not very nice from the mentor side of things where you’re taking your time out of your day to help someone else and it’s not reciprocal there. I think that’s the least you can do. That’s my personal opinion so that’s not necessarily something you have to do, but something to keep in mind anyway. That’s a great way to meet people. Don’t go, “Oh, I’m looking for a mentor so I’m here to look for a mentor.” But just talk to people. Get to know their stories. Find the people that you feel will be the best fit for you and ask if you can hang out. You don’t necessarily have to formalise it as, “Will you be my mentor?” You can just say, “Can we go have lunch some time. I’d love to buy you some lunch and take you out.” Look, you’re going to talk about property anyway, they’re going to give advise anyway. Because people who are property investors generally pretty passionate about it and love to talk about it. So you don’t always need to formalise the arrangement. That’s on great way to find people. If you know anyone within your direct network – maybe it’s family members, co-workers, friends or friends of friends who are successful property investors, then you can find people that way as well. And then, if you’re going to pay for mentorship, there’s 2 ways you can go about it. There’s a bunch of different mentor programs out there. Again, if the mentor program is them selling you property and helping you do it. They’re going to find the property for you and all of that sort of stuff, be really careful. Because there are mentorship programs out there that are kind of like a cover up for them selling you new build properties and so, avoid that sort of stuff. But, there are mentorship programs that are purely educational. So they’re not selling you individual properties or anything like that. They’re much better because they don’t have that ulterior motive of getting a commission to sell a property. Let’s say you’re looking for those sorts of people, you can look around. There’s a whole bunch here in Australia. Steve McKnight, Dymphna Boholt has one. Though, I’ve heard her sales strategies can be quite aggressive, so be careful with that. Who else is there? There’s a bunch of different people. If you just search for the different property podcast, a lot of those people have mentorship programs. So, you can go out and search for them. And again, it’s about lining up what their strategies are with the way you want to invest, finding the best fit and considering investing in that mentorship program. The second strategy when paying for mentorship that I actually prefer for most people is to hire a buyer’s agent. Now, you’re not going to get necessarily the lovey-dovey sort of long term mentorship that you would if you’re investing in mentorship program. But, what I do love about a buyer’s agent is that you get a result. So you’re hiring them to be your mentor for your next property purchase. You sign them up, they become your mentor. They go out and they help you find good suburbs, good properties, they go through those properties with you until the point when you buy that property. And when you buy that property, their job is done, they’re no longer your mentor anymore. But, the thing I love about this is that so often, I see people pay for mentorship programs and then do nothing. Personally, I was 18 and I paid $6,000 Australian at the time for a mentorship program that I did very little with. Whereas, with a buyer’s agent, you might pay that amount just to get one property and it’s a limited mentorship. But, you know at the end of the day, you’re going to get that property because that’s what you’re actually paying for. And if you choose a buyer’s agent that’s really friendly, someone who’s willing to coach you along the way, to tell you why they’re making that decisions that they’re making. So, that’s something to think about. You can pay for just regular mentorship or you can pay for a buyer’s agent who’s going to be a mentor for a limited amount of time, but you’re going to get that end result. I really like that and I think that’s great for a lot of people because I know, myself included, it’s so easy to go down one path but then get distracted. Life takes over, your kids get sick, you end up in a hospital, jobs change, you get distracted, new girlfriend or boyfriend or something like that and you get distracted from your goal. But, if you’ve hired a buyer’s agent, the process kind of keeps going until it’s done. So, I really like that. I hope that that gives you some ideas about how to find a good mentor for investing in property. I hope that you can go out there – to go to a meet up and find some people. Maybe find some people through your network or if you go to hire a mentor, then I wish you the absolute best of luck with that as well. I don’t run my own mentorship program. I don’t mentor people personally, sorry. But, I do run a membership site where I share positive cash flow properties and I have courses on how to find positive cash flow properties. So, if you’re not looking for something that’s going to cost thousands of dollars to be a mentor, but you’re looking for just a low monthly cost to get some education, to see some positive cash flow properties, then head over to onproperty.com.au and you can check out the membership options over there. I hope that this has been helpful to you. And until next time, stay positive.